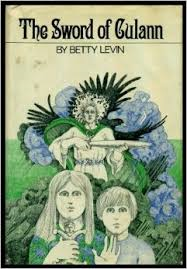 The Sword of Culann, by Betty Levin (1973) (time travel tourism to ancient Ireland!) was supposed to be last week's time slip Tuesday book, but in as much as I am the sort of person I am, I thought "I will have an Irish time travel book for St. Patrick's Day" at 4:30 in the afternoon, which didn't give me enough time to finish reading it, let alone writing about it. So here it is today. The Sword of Culann, by Betty Levin, (Macmillan 1973) is about two kids (step siblings) who, while spending a week camping on an island off the coast of Maine (the camping part, with sibling dynamics, is the best bit of the book), travel back in time to Iron Age Ireland, and who witness the events of the Cattle Raid of Cooley first hand. The time travel mechanism is the strange sword hilt belonging to an old sea-Yankee man, the sort of strange old man who lives in a shack with a crow and lacks a certain freshness. It is a magical sword hilt--when the mists come up off the coasts, it allows people from our time (like the old man's father) to go back to ancient Ireland (there's a kind of tenuous connection between an island of the coast of Maine and ancient Ireland, but not enough of one to satisfy me). So in any event, Claudia and her little brother Evan show up in Ireland before the Cattle Raid actually starts, and are taken under the wing of Fergus (because he's that sort of person, I guess, who realizes their strangeness but is not repulsed by it; once again any more convincing reasons kind of escaped me, if they were there at all). And Claudia becomes one of the female help, and Evan works in the stables, and it is all very ancient Irish and then Queen Medb assembles her army and they all go off to attack Ulster, which is guarded only by the hero known as the Hound of Ulster. And the old man's crow shows up and hangs around Claudia, and it is not a good thing to be a girl in a war in ancient Ireland with a crow hanging around you (cause of the Morrigan, but I don't think Levin makes this Clear), so Claudia is going to be sacrificed to a bog but she and Evan get back to Maine, and then Evan goes back in time alone to see the actual battle and then comes back and tells Claudia about it, which isn't the most graceful way to tell a story of a battle, and then Claudia goes back alone and sees Fergus one last time before he turns into dust (for reasons). This one disappointed me as an adult for exactly the same reasons it would have disappointed young Charlotte--there was not particular emotional hook. There was not point to the time travel- Claudia and Evan didn't affect the past, nor were their lives profoundly changed (although they sure know a lot more about Dark Age Irish material culture.... It was, really, just a tourist trip. And a kind of bloody, unpleasant, anxious one at that, with no beauty or awe inspiring mystery to it such as one wants Celtic time travel to have....part of the problem is that, for an outsider, the whole Cattle Raid business make the Trojan War seem Pointful and worth-fighting. Fergus, with his deeply conflicted loyalties, is an interesting character, but since he can't even remember Claudia when he's telling the story many years later (just before turning to dust) there's not much connection between him and our point of view character. And the cover sure doesn't do a whole of a lot to draw in the reader of today. Those lumpen kids have no spark of force vitale to them at all, and the Irish dude (presumably Fergus) behind them is unappealing, and does not appear to know how to hold sharp blades. "The children adjust as well as they can [not very well] to talismans electric with taboo and to the capricious, snarling, gloomy and wise-cracking people they find so frequently bewildering. Claudia, fascinated by and devoted to sad Fergus, acts as his emissary among exiled Ulidians [people of Ulster] and rallies them with an enchanted [not really] bead [to no particular effect....]. Then Claudia, horrified to discover that she is considered immortal [more like "supernatural"], even by Fergus, and therefore expected to undergo a sacrificial death, barely escapes with Evan to Maine. The characters are stirring creations, from a ferocious Queen Medb to a kitchen matron called the ""great Mother,"" and although the plot is labyrinthian it's well worth staying on for the surprises and layered revelations at every turn. Uh. Maybe I was not intellectually engaged enough to notice the "layered revelations." It happens. And ack! According to the Goodreads blurb, there was "emotional growth" and I missed that too! Bad reader. Bad. In any event, for "Celtic" time travel, I'd much more strongly recommend A String in the Harp, which is a gem of a book, and for retellings of the Irish epics, I'd suggest Rosemary Sutcliff's The High Deeds of Finn MacCool (although that's not fair, since I think that's a stronger story to start with than the Hound of Ulster is). That is indeed an unappealing cover...I'll have to check out Sutcliff's book. I'm interested in reading more about Irish legends, folktales, etc.